We're proud to provide Mapping services. Rainforest Alliance's Global Impact Map. Interactive mapping for visual storytelling. Rainforest Alliance needed an effective way to illustrate their global efforts to preserve one of the earth’s most valuable resources: the environment. Most recently impressive is the mapping project that we unexpectedly threw on Rob and Tom’s lap, and which they handled quickly and expertly. 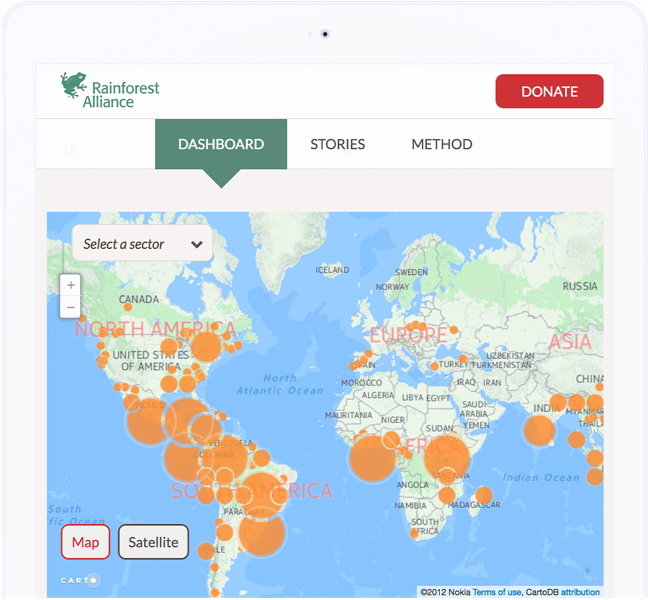 Knowing that a simple page with paragraphs wouldn’t suffice, we built a map that allows the Rainforest Alliance to display data from a specific region. The user can then zoom in on those regions or look at specific data points to learn more. The map takes a large spreadsheet of geodata, created based on information from the Rainforest Alliance’s CRM, and creates an interactive map powered by CartoDB that allows users to see RA-certified organizations, and what they do. The project took less than a month to complete, using a combination of Kanban and XP management processes. 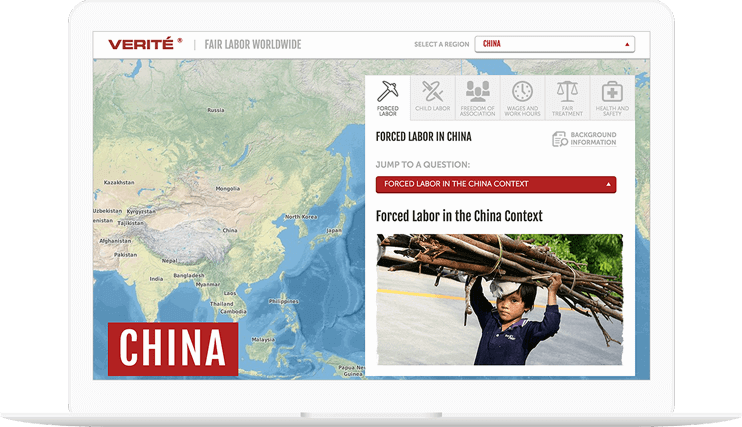 Verité has an immense amount of data that has been collected over the last 30 years regarding labor worldwide. Internal efforts are ongoing to collect all of the hand-written and paper reports into a centralized database that can be queried and sorted. For the lay-person the data was still just numbers and figures. They needed a way to visualize the data for use by researchers, academics, and the general public. We wanted to ensure the data was exciting to work with. Far too often, data is presented as merely tables and numbers. 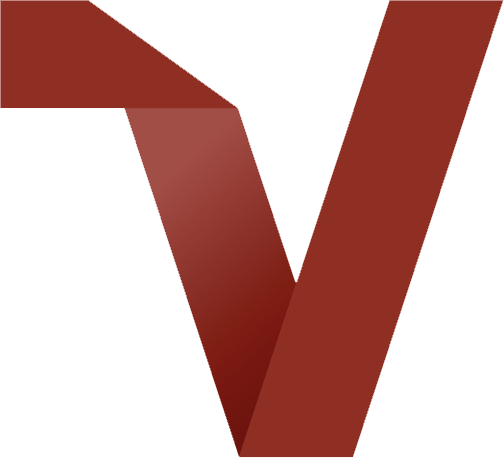 From the start we wanted to tell a story about the data, so together with Verité, LCM crafted a question-and-answer-based approach to displaying the data with creative charting and mapping elements built to place emphasis on the results of the data. 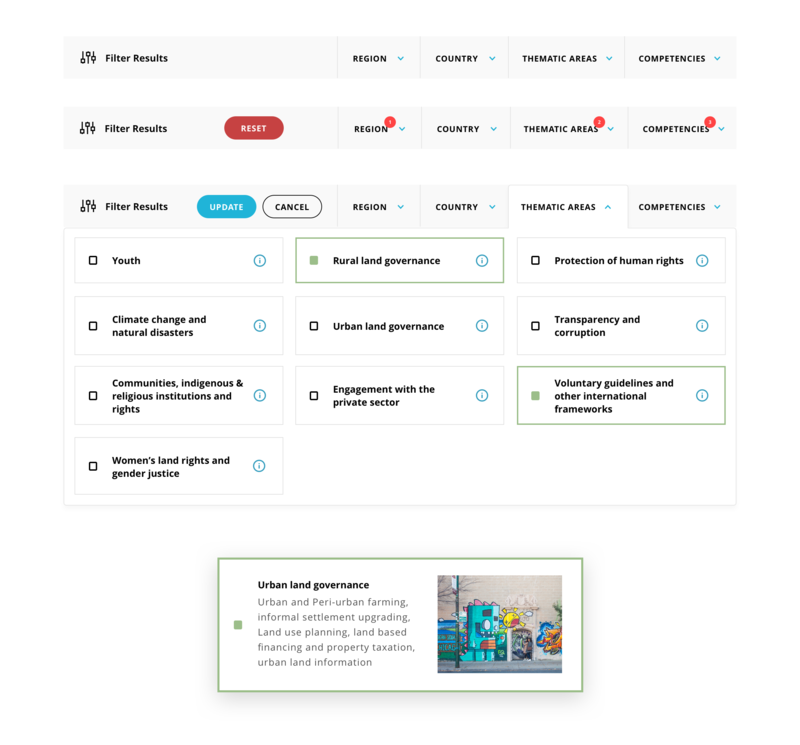 The site’s functionality continues to be expanded as data is collected with additional visualizations and database connectors to provide real-time data for global results. 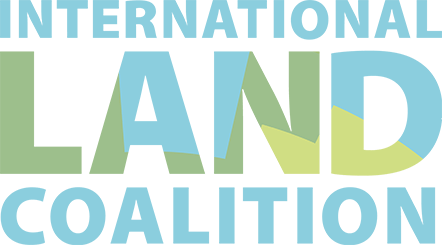 Working with the International Land Coalition gave us another opportunity to use our agile design process, generating ideas and a few unique solutions. ILC has a lot of work going on around the world and we wanted to give users a way to explore the content on the site about each specific project that’s going on and the members involved. Our approach was to focus in on the exploration aspects.  What would give users the best sense of context of these global projects? How do we give attention to the members involved? What’s the best experience for sorting through the variety of project categories, subcategories and locations? And how do we present all this information without overwhelming the user? It was crucial we let ILC know that this is a journey we’ll both overcome together and they have our full support, as well as expertise with regards to questions or insight. 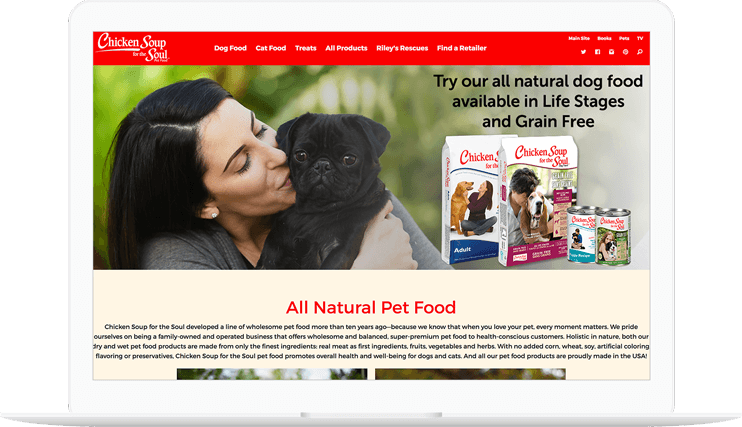 They had many different goals for the project, but with the specifics undefined, we worked with them to help figure out the details and create a fully-realized vision. The project’s dynamic was healthy constant dialogue between our creative team and everyone on the ILC team. We listened to their insights, we heard the things we needed to consider and the parameters we should work within. As things progressed, we started checking off the points on everyone’s checklists in order to be confident about the direction we were going. The thought process behind it was pretty straight forward. Present a lot of options and information without overwhelming the user, make it accessible while browsing and allow some filter terms to tell their own story on hover. It took a few tries to get here, but we believe it accomplishes those goals. Our work was well received by the ILC board and our solutions for giving their site users the best sense of context of resource content from all over the globe was deployed on time and budget. Site users are now experiencing new ways to learn about ILC members through new ways of exploring a variety of categories and locations.